Activists, members of the Human Rights Association Istanbul branch, holding posters with photos of missing Saudi journalist Jamal Khashoggi, talk to members of the media, during a protest in his support near the Saudi Arabia consulate in Istanbul, Turkey, Oct. 9, 2018. European governments — in addition to the U.S. — appear perplexed about what action to take in response to the disappearance of Saudi journalist Jamal Khashoggi, who vanished two weeks ago after entering his country’s consulate in Istanbul. While most media attention has focused on the U.S. reaction to Khashoggi’s disappearance, European governments are also wrestling with a quandary about how to punish Saudi Arabia, if it is found beyond doubt to be behind the journalist’s disappearance, without destroying what they say are valuable relations with the Gulf kingdom. The questions policy makers are asking include: Should they confront Riyadh more as they demand answers about what befell the journalist and prominent critic of Saudi Crown Prince Mohammed bin Salman, even if that wrecks security cooperation with Riyadh and endangers trade and lucrative weapons sales with the Gulf kingdom? 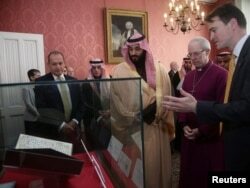 Britain's Archbishop of Canterbury Justin Welby shows The Crown Prince of Saudi Arabia Mohammed bin Salman the Birmingham Koran manuscript - one of the earliest surviving records of the Koran, written in Hijazi, and radiocarbon dated to between 568 and 645 AD - during a private meeting at Lambeth Palace, London, Britain, March 8, 2018. Or should they give the benefit of the doubt to the Saudi government, which claims Khashoggi left the consulate safely by the back door and that nothing happened to him inside the building, but risk by doing so undermining their own much-lauded insistence on the observance of global norms and rule-based values? Another factor at play as they weigh how to respond is who will benefit from a confrontation between the West and Saudi Arabia. Some policy makers and analysts say Iran, Saudi’s arch-rival in the region, would be a beneficiary. “As it has done in the past, Tehran will leverage this latest crisis to shore up its regional position,” cautions Sanam Vakil of Britain’s Chatham House research organization. “In the face of forthcoming U.S. oil sanctions and coordinated pressure from the U.S., Saudi Arabia, the UAE and Israel strategy – and as the EU attempts to preserve the nuclear accord after Washington’s withdrawal – the opportunity could not come at a better time for Tehran. Iran has repeatedly seized on Saudi miscalculations to gain leverage and protect itself from regional isolation,” she says. Khashoggi disappeared after entering the Saudi consulate in Istanbul to complete paperwork to finalize his divorce from his Saudi wife. Turkish officials say they believe Khashoggi was killed inside by Saudi assassins with links to the crown prince and that his body was dismembered and removed while his unwitting Turkish fiancee waited for him outside the consulate. The Saudis strongly deny the claim — and Saudi leaders reiterated their innocence Tuesday to U.S. Secretary of State Mike Pompeo, who was dispatched to the Saudi capital, Riyadh, by President Donald Trump to discuss Khashoggi’s disappearance with the leaders of the Gulf kingdom, a close U.S. ally for 73 years. On Wednesday, a senior ally of German Chancellor Angela Merkel issued the strongest warning yet from a European government about possible punishment, saying that Europe may have to adjust its relations with Saudi Arabia in the wake Khashoggi’s disappearance. “We have a very ambivalent picture of Saudi Arabia, especially with what has happened in the Khashoggi case in recent days, and what emerges in the coming days will complete that picture. Europe may need to correct its policies toward Saudi Arabia,” Juergen Hardt, foreign policy spokesman for Merkel’s ruling Christian Democrats, told broadcaster Deutschlandfunk. But rights campaigners and European opposition politicians who want a tougher approach to be adopted towards Saudi Arabia over Khashoggi’s disappearance say the German comments fall short of what is needed and fit a pattern of hedged remarks from European governments and officials. They note Hardt cautioned that as yet there are no plans for imposing sanctions on Saudi Arabia. A joint statement on Khashoggi’s disappearance Sunday by Britain, France and Germany also made no reference to possible sanctions. British Foreign Secretary Jeremy Hunt later cautiously announced Britain would consider an “appropriate way to react,” if it transpired the Saudis royals were found to be behind Khashoggi’s disappearance and likely death. In Britain, Labour foreign affairs spokeswoman Emily Thornberry says the British government has a “blind spot” when it comes to Saudi Arabia.” She criticizes Foreign Minister Hunt for taking a week after the journalist’s disappearance before issuing a tweet saying he was urgently seeking answers from Saudi Arabia. Activists from Avaaz stage a protest timed to coincide with the visit by Saudi Arabia's Crown Prince Mohammad bin Salman outside the Houses of Parliament in London, Britain, March 7, 2018. “Imagine how this government would have reacted if either Russia or Iran had abducted – and in all likelihood murdered – one of their dissident journalists within the sovereign territory of another country,” she says. British officials privately say they are trying to find a way to project outrage while at the same time keeping intact what they see as an important alliance. They argue Saudi Arabia is a key partner in the fight against extremist violence and that intelligence supplied by the kingdom’s security agencies has been crucial in thwarting terrorist plots on British soil. And they say the bigger strategic picture in the Middle East needs to be taken into account. Saudi Arabia remains the one Arab state that is still reliably aligned with the West in the region, a point German officials echo. They also acknowledge that the trade relationship after Britain leaves the European Union is earmarked to become more important. Twenty-three percent of the arms and weapon systems the Saudis’ purchase come from British defense firms. In the first six months of 2017, Britain sold Riyadh military equipment worth more than $1.4 billion, with thousands of British jobs dependent on the sales. Riyadh remains by far the biggest overseas market for Britain’s arms industry, accounting for almost half of all British arms sales between 2007 and 2016. But some analysts warn that placing so much emphasis on economics is a mistake. Relations need “to be based on a more nuanced understanding of the potential costs and benefits, so not just driven by economic interests,” Armida van Rij, an analyst at The Policy Institute at King's College London, told a conference in London just days before Khashoggi disappeared. Possible reputational damage from having close ties with Saudi Arabia at a time the kingdom is pursuing a highly aggressive foreign policy and cracking down on dissidents should also be taken into account, she says. By being tied to Saudi Arabia “does it affect your credibility on the international stage? Does it affect your credibility as an international actor? These are bigger questions that, at the moment, are not really being discussed,” she added.